Australian Woman Sentenced To Die In Malaysia For Drug Smuggling : The Two-Way Lawyers are appealing the sentence and say the 54-year-old from Sydney was the victim of an online scam. Maria Elvira Pinto Exposto was escorted by police during a court hearing in Malaysia in December, where she was exonerated of drug smuggling charges. On Thursday an appeals court overturned the ruling and sentenced her to die by hanging. Maria Elvira Pinto Exposto's lawyer says the ruling will be appealed. "An appeal will be filed in the Federal Court — the final appeal," lawyer Muhamed Shafee told CNN. 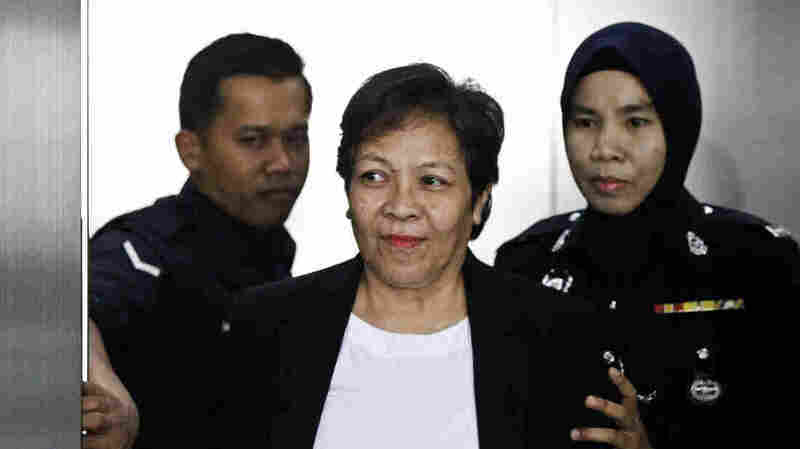 Exposto, 54, was arrested in December 2014 in the capital city of Kuala Lumpur on her way home to Sydney from Shanghai. She was scheduled to catch a connecting flight but was detained after she put her bags through an airport security scanner and more than 3 pounds of crystal methamphetamine was detected inside one of the bags. Exposto, a mother of four, said she had no idea she was carrying the drugs. She had traveled to China to meet up with a man who said he was an American service member with whom she had developed an online romance. Customs officers found the drugs stitched into the lining of the bag given to her by the man who said his name was "Captain Daniel Smith" from the "US Special Forces," reports the Australian Broadcasting Corp.
Exposto said she thought she was carrying a bag full of clothes for him. "There was clear evidence that she was the victim of an Internet romance scam," Exposto's lawyer, Tania Scivetti, told The Associated Press. "She was a drug mule." The High Court in Malaysia apparently agreed and had acquitted her in December. But the prosecution appealed and on Thursday the court sentenced Exposto to death by hanging. Scivetti told the AP that Exposto was shocked but calm after the ruling by the three-judge panel. Shafee, Exposto's other lawyer, called it "a perverse judgment, no reasons were provided. The High Court judge examined every detail in the evidence and in today's decision they simply reversed the decision without reason and sentenced her to death," reports Australian Associated Press. Malaysia has notoriously harsh drug laws with mandatory death sentences for anyone found guilty of carrying more than 50 grams of an illegal drug, according to the AP. Diplomatic relations between the two countries have been strained since Malaysia hanged three Australians convicted of drug smuggling within the past three decades: twice in 1986 and again in 1993. "Australia opposes the death penalty in all circumstances for all people," Australian Foreign Minister Julie Bishop said in a statement Thursday. Bishop said her department would continue to provide full consular assistance to Exposto, reports news.com.au.